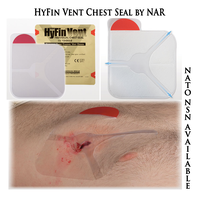 The new HyFin Vent Chest Seal from North American Rescue sets the standard for the treatment of penetrating injuries to the chest. The new HyFin Vent Chest Seal design provides 3-vented channels that prevent airflow into the chest cavity during inspiration while allowing air to escape through the vent channels during exhalation. The 3-vent channels allow blood to escape and also provide a backup fail-safe system, as even if two of the three channels become obstructed, the vent will remain fully operational. Package: 7.75 in. x 7.75 in. Chest Seal Size When Deployed: H 6 in. x W 6 in.